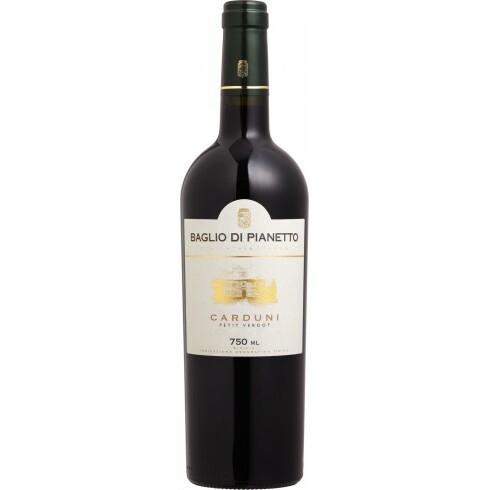 Baglio di Pianetto Carduni Rosso Terre Siciliane Offer | Saporidoc UK. The vines for the Carduni Rosso grow in the Santa Cristina Gela vineyard at around 650 m. altitude at Baglio di Pianetto Winery in close proximity to the city of Palermo. The grape harvest and sorting is done manually in the vineyard, considering the small amount of grapes selected for each plant. The grapes are de-stemmed and partially crushed, followed by a short a prefermentation at low temperature. This secures a better fermentation quality for the Petit Verdot, balanced and long in relation with the maceration. The wine is aged in French fine-grained partially toasted oak barrel for 18 to 28 months depending on the vintage and on the character of the wine. This process provides a very rich and complex wine that expresses the particular characteristics of its grape and of the land in which it is produced. Bouquet: Intense and grassy, characterized by hints of liquorice and bitter cocoa together with balsamic and spicy notes. Taste: On the palate it is a strong and full-body with a good structure and a long finish.